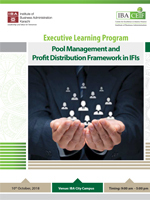 IBA Centre for Excellence in Islamic Finance (IBA-CEIF) is pleased to offer an advanced level course on "Pool Management and Profit Distribution Framework in IFIs". This one-day course will enable the participants to gain practical insights about the profit calculation and distribution mechanisms and Pool Management guidelines in Islamic Financial Institutions based on the unique Mudarabah based deposit structure. Classroom exercises will be used to further consolidate the knowledge of the participants.